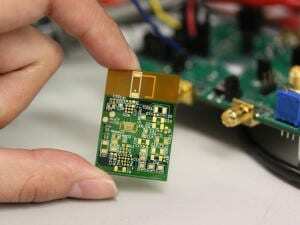 Electrical engineers at Oregon State University have developed new technology to monitor medical vital signs, with sophisticated sensors so small and cheap they could fit onto a bandage, be manufactured in high volumes and cost less than a quarter. A patent is being processed for the monitoring system and it’s now ready for clinical trials, researchers say. When commercialized, it could be used as a disposable electronic sensor, with many potential applications due to its powerful performance, small size, and low cost. Heart monitoring is one obvious candidate, since the system could gather data on some components of an EKG, such as pulse rate and atrial fibrillation. Its ability to measure EEG brain signals could find use in nursing care for patients with dementia, and recordings of physical activity could improve weight loss programs. Measurements of perspiration and temperature could provide data on infection or disease onset. And of course, if you can measure pulse rate and skin responses, why not a lie detector? “Current technology allows you to measure these body signals using bulky, power-consuming, costly instruments,” said Patrick Chiang, an associate professor in the OSU School of Electrical Engineering and Computer Science. The much higher cost and larger size of conventional body data monitoring precludes many possible uses, Chiang said. Compared to other technologies, the new system-on-a-chip cuts the size, weight, power consumption and cost by about 10 times. Some of the existing technologies that would compete with this system, such as pedometers currently in use to measure physical activity, cost $100 or more. The new electronics developed at OSU, by comparison, are about the size and thickness of a postage stamp, and could easily just be taped over the heart or at other body locations to measure vital signs. Part of what enables this small size, Chiang said, is that the system doesn’t have a battery. It harvests the sparse radio-frequency energy from a nearby device – in this case, a cell phone. The small smart phone carried by hundreds of millions of people around the world can now provide the energy for important biomedical monitoring at the same time.